The Rhode Island Department of Environmental Management (DEM) announces that four state campgrounds will open for the season on Friday, April 12. This year's opening of Burlingame, Charlestown Breachway, Fishermen's Memorial, and George Washington Memorial State Campgrounds coincides with the beginning of school vacation week, giving families an extra opportunity to enjoy the natural beauty of the South County and northern Rhode Island countryside. East Beach State Campground, in Charlestown, opens on Friday, May 24. 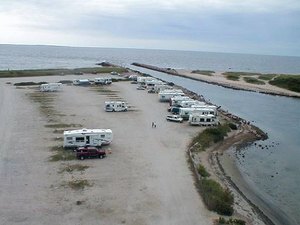 The campground openings in Charlestown and Narragansett give anglers in southern Rhode Island a place to camp while awaiting the Saturday, April 13, opening of the trout fishing season. Many anglers in northern Rhode Island traditionally camp at George Washington Memorial Campground, DEM's 100-acre venue in Glocester that opens for the season every year on the evening before Opening Day. Trout Stamps are not required for persons possessing trout taken from a lake or pond that shares a border with Rhode Island. Fishing licenses can only be purchased online. Online fishing licenses and the Trout Conservation Stamp also can be obtained via an authorized agent. As part of a larger network of recreational opportunities in the state, campgrounds play an important role in supporting public health, attracting tourism, providing affordable staycation options for Rhode Island families, and promoting a healthier environment. Rhode Island's natural and public assets – including 1,000 campsites, 8,200 acres of parkland, 400 miles of hiking and biking trails, 200 fishing spots, 25 parks and nature preserves, and eight saltwater beaches – are magnets, attracting more than 9 million Rhode Islanders and tourists a year. They're also an engine that add an estimated $315 million to the economy, generating nearly $40 million in state and local taxes and supporting nearly 4,000 jobs a year. Last month, DEM filed a regulation proposing to raise camping fees for the first time since 2002. This would put camping fees more in line with the rates charged by public and private campgrounds both in Rhode Island and nearby states, as required by law. DEM is seeking to shift a portion of the funding burden for camping and site rentals from the Rhode Island taxpayer to the users of these services. As part of Governor Raimondo's initiative to support and celebrate state parks and beaches, DEM hopes to reinvest the new revenue – which will be estimated once the public rulemaking process is complete – back into Rhode Island's system of parks and beaches. According to a recent study, Rhode Island's parks and beaches rank first nationally in visits per acre but 47th in state support per visit. If approved after the rulemaking process, the new fee structure would be applicable to new reservations; rates for campground reservations booked before enactment of the new regulation will not change. The draft regulations can be found on the Secretary of State's website. Since 2012 and using the Rhode Island Capital Plan Fund, DEM has invested $6.3M in campground upgrades. These include $5.4M for utility upgrades and new bathrooms at Fishermen's Memorial Campground in Narragansett and $898K to bring modern, fully accessible restrooms and shower facilities to George Washington Memorial Campground in Glocester for the first time. With new fees and funding, DEM hopes to improve state parks and campgrounds and improve visitor services and amenities with cleaner facilities and bathrooms, new and expanded outdoor recreation opportunities such as bike rentals and kayak excursions, Wi-Fi at some locations, and online state beach passes and site rentals. Campsites sell out quickly during the peak season; campers are encouraged to book their sites early at www.riparks.com. The reservations program is operated by ReserveAmerica, a company that manages reservations for campsites nationwide. There is no cost to the state for the program, as funding comes solely from transaction fees associated with the services. Reservations may be made online at www.riparks.com, and through a toll-free reservations line, 1-877-RICAMP5 (742-2675). DEM urges all visitors to Rhode Island campgrounds and parks to help stop the spread of non-native insects and diseases. Transporting firewood can also transport invasive and otherwise harmful insects and diseases that threaten the health of the state's forests. Gypsy moth, emerald ash borer, and beech bark disease are just a few of the growing number of firewood hitchhikers that can kill large numbers of trees. • Do not bring firewood with you when you camp. • Buy firewood when you reach your destination. • Don't take any firewood with you when you leave. Burn it all or give it to other campers in the park.